Mark Offers a Wide Range of WWI & WWII Memorabilia at Military Fairs and on this site and offers a 14-day Guarantee. Want to know when the stock and photo-galleries are updated? (Your details are safe; once you've confirmed you only get emails about new additions to our stock list and photo-gallery... nothing else). Collecting Militaria Memorabilia, whichever era you are interested in, is a fascinating pastime. It has been my passionate hobby since childhood - my particular interest has always been in WWI and WWII, specialising in Luftwaffe and RAF memorabilia. After restoring and kitting out many wartime vehicles, I turned my hobby into a Militaria Collectibles business in 1996 - and this website is part of that business. (A bit further down you’ll find some tips on how to use this site, particularly useful if you are new to browsing with a Windows based PC). When you find a dealer who was a collector themselves there is a kindred spirit, an interest shared. I am still fascinated with all the different equipment, medals, keepsakes, helmets, uniforms and vehicles from that period of history. There are many tasty items in my stock listing that I would love to keep - but if I did that I wouldn’t have a business! So now I enjoy finding interesting WWI and WWII collectibles and researching their story wherever I can. I get my pleasure from your delight when you get the item you’ve been searching for in your hands. I believe in offering these military collectibles at fair prices and always describe the pieces honestly. If I know there is something ‘not quite right’ I will say so. Items that are definitely reproductions are described as such in my catalogues. Plus, I offer a 14 day money-back guarantee, which gives you time to inspect the item you’ve purchased and do any research you want. If you do decide to return an item I do ask that you let me know why you don’t wish to keep it, although this does not affect your guarantee. I’m glad to say my ‘honesty is best’ policy means I get very few returns and have a great number of collectors who enjoy the pieces I find for them. On this site you will discover photo galleries of WWI and WWII collectibles. In the gallery: ‘Sold Items Photos’ you can browse some of the items that have passed through my hands. Items such as an RFC Flying Helmet and Uniform; RAF B & C type helmets; Luftwaffe LKPS100, LKPW100 & LKP101 type helmets together with oxygen masks; German Army officer’s car pennant; a pilot’s badge in German silver; several pairs of German binoculars in fine condition and scarce items such as flying jackets; Mae West and Schwimmveste. In the ‘Aviation Stock and Militaria Stock Photos’ there are photographs of my current stock; you’ll find the descriptions and prices in the ‘Online Catalogue’ listing. Please feel free to email any questions about items you are interested in. In the ‘Wartime Photo Gallery’ is a selection of original photos - taken from my own personal collection. It is a real shame that over the last few years a large number of fakes and forgeries have come onto the market. Some of these are so accurately reproduced it’s very difficult - even for the most experienced dealer or collector to distinguish them from the originals. So you can appreciate that for anyone who is fairly new to this hobby it is very easy to get ‘your fingers burnt’. And of course, once that’s happened, you become very wary and, in some cases, I’ve heard of people giving up collecting altogether because it is such a minefield. I’d strongly suggest that wherever possible you buy from a reputable dealer you can trust and who offers a guarantee. Ask fellow collectors who they know who has a good reputation and is fair in their dealings. If someone offers you a ‘genuine, original item’ - check its history as far as you can and check if the price is right. Seeking advice and doing research always pays dividends. If you find something at an auction do try to do some research before you start bidding - it is so easy to get carried away and bid more than the item is actually worth! Looking at a site like this, browsing pictures, reading descriptions and checking prices will help you. Look at my items identified as reproduction and, where there is a picture, study it and compare to a true original. In time you’ll begin to spot the telltale points between originals and reproductions. The majority of the items listed also have photos in the ‘Stock Photo Gallery’ - but not all. If you don't find a picture of something you are looking for you may find the item described in the stock listing. If you want to see a picture before deciding to buy, send me an e-mail and I'll send a photo over to you as soon as possible. Please be patient - I may have to take a photo especially for you - but I will respond as quickly as I can. Make sure all open windows (except this one) are minimised or closed. Click the Stock Photo Gallery link on the left of this browser window. The stock picture gallery opens in a new browser window. A menu will appear including options for tiling windows. Choose to tile horizontally or vertically, whichever you prefer. In this original browser window, click the link on the left for the ‘Online Catalogue’ listing. You now have the picture gallery in one browser window and the descriptions in the other. Browse the pictures, click on a small picture to see a larger view. If the picture has an M number it will be described in the stock listing. Type the M number in the search box in the left panel of the Online Catalogue window and click Search. You now have the picture in one window and the description and price in the other. These collectibles are made available at weekend militaria fares and listed in a printed catalogue, which means other people may buy. So, if you want to check availability, or ask any questions please use the e-mail link on the picture gallery or next to the description. Or you can phone +44 (0) 1929 423411 between 9:30am - 7:00pm GMT weekdays. Please note the office is closed until 4:30pm on Thursdays (that's when I go out scouting for new stock) and I'm usually at militaria fares at the weekends. Sometimes you will catch me in on a Saturday between 10:00am - 5:00pm GMT. Mon-Fri, 9.00 a.m. - 5.30 p.m. 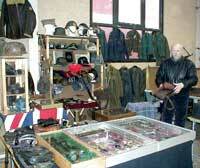 Remember we are always looking for militaria to buy and exchange - as well as selling.